Yeah I certainly see that. 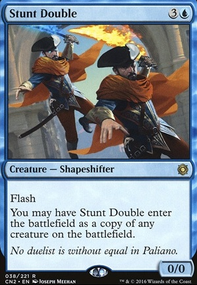 Well, now my only gripe is... no Teferi, Temporal Archmage ? Its + is pretty good ( Sleight of Hand is lightly played- and more than lightly if you could repeat it every turn) and its ult is full-on bonkers. Thanks for the feedback Oloro_Magic. The main reason there were no fetchlands in this deck were simply because of the fact that whenever I found Reveillark , Viscera Seer , or Body Double with Taigam's Schemeing or Contingency Plan I needed to put it on the bottom of my library with Opt , Sleight of Hand , etc to make sure I didn't draw it and shuffling my library messed up all of that. 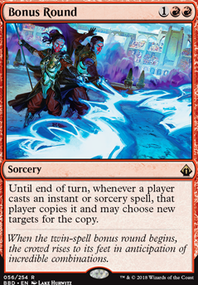 But you make a good point, Rakdos would grant the deck many more benefits than Dimir would. I think I'm gonna keep this deck in the Dimir colors, but I will definitely start making a separate version of the deck in the Rakdos colors soon. Once again thanks for the in depth feedback on the deck, always appreciated. Anger of the Gods seems like an odd sideboard for this deck as it roast all of your Arclight Phoenix out of the game. 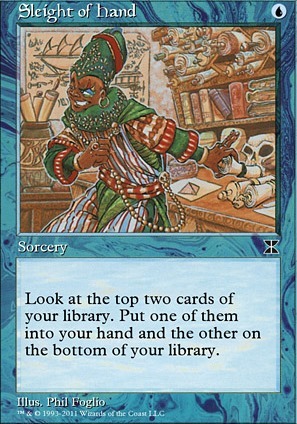 Might also want to replace Sleight of Hand and/or Serum Visions with some cards which allow you to graveyard drop instead of putting cards on the bottom of your library. Nice cruel brew! Something I have seen in another C.U. deck on here was running Nihil Spellbomb in the mainboard to nuke a GY/cantrip... any thoughts on maybe swapping it in over Sleight of Hand to really bolster Rakdos Charm ? Mystical Tutor : one mana instant tutor to search for any one instant or sorcery card. Mystic Remora : one of the best enchantments for draw in multiplayer Commander. Blue Sun's Zenith : repeatable instant draw since it's put back into your library after it resolves. Archaeomancer : good in combination with spells that can return target creature to your hand so you can play it again recurring spells. Spellseeker : can tutor for Tide or any other one or two mana instant or sorcery spell. Very good with bounce spells to be able to bounce it back to your hand and play it again tutoring for another spell. Dig Through Time : powerful spell with delve, when you have a lot of other spells in your graveyard. Snap : bounce Archaeomancer back to your hand to then replay it and recur Tide. Capsize : six mana bounce spell that can be repeatable with Tide. Repeatedly bounce Archaeomancer and play it to keep recurring and playing Tide. 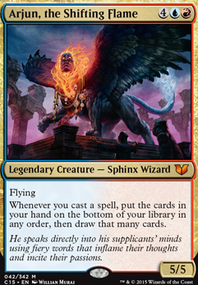 Peregrine Drake : having a creature who can untap five lands is good with bounce spells. If you like some of these cards suggestions I can help you to make cuts.